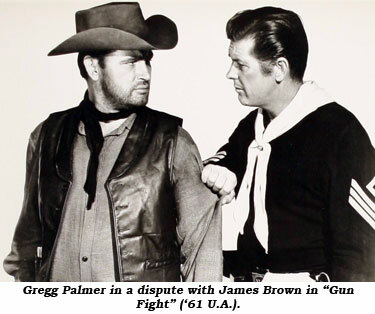 A leading man career was in the works for Palmer Lee/Gregg Palmer at Universal-International in the early ‘50s until the studio system changed and U.I. dropped many of their contract players in the mid ‘50s. Born Palmer Edwin Lee January 25, 1927, in San Francisco, California, his father, Olaf Ludwig Lee, came to the U.S. from Norway in 1907 to join the American Army. The Norwegian spelling of the name is Lie, but it was changed to Lee in the U.S. Palmer’s father, a carpenter who built houses, met his wife Emma Andrea Hammer in San Francisco. Palmer graduated from Lowell High, a college prep school, in 1943 and signed up with the Army Air Corps who sent him to the University of Utah under their Army Specialized Training Reserve Program in 1944. This was followed by a cryptology (code) course. Most of Palmer’s duty time was spent at Waller Field in Trinidad. Discharged from the service in 1946, his plans to become a corporate attorney were altered when a friend invited him to go along on an audition for a radio staff announcer position at NBC. On a lark, Palmer auditioned himself. The friend wasn’t hired but Palmer was. Following a stint at NBC, he went to work at a new station, KEEN in San Jose, California. While there he was encouraged to entertain the possibility of becoming an actor by former ‘30s actress Noel Francis (who had been a leading lady to Tom Mix, Buck Jones and others). Nothing came of it when Palmer auditioned in ‘49 at 20th Century Fox while still employed at KEEN. Then, while working as a floor officer (bouncer) at the Palladium in Los Angeles, he made the rounds of the studios. 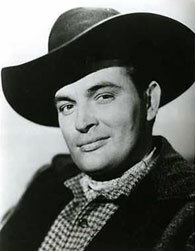 Without a studio contract, after a few bit roles, Palmer was nearly ready to return to San Francisco, when he was offered a contract by Universal-International in late ‘51. name. It didn’t hurt Humphrey Bogart or Arnold Schwarzenegger. I think U-I was going for a heavy sound, like Tab…or Rock…” Unfortunately, Gregg’s timing was off, the studio system was changing and U-I released him and several others. Oddly, one of his first films freelancing was “The Creature Walks Among Us”—right back at U-I in 1956. Gregg continued to freelance into the early ‘80s, including several films in Europe in the ‘70s, then six films with John Wayne, the most notable role being John Goodfellow, the vicious, wild-eyed, machete wielding member of Richard Boone’s gang in “Big Jake”. Gregg married Ruth Stump Brooks, a nurse, in 1967. They had no children, but Gregg inherited a ready-made family of three children from Ruthie’s prior marriage. She died of cancer in 1999. Semi-retired today, Gregg Palmer, a consummate performer and comedian, has been involved attending Western film festivals.